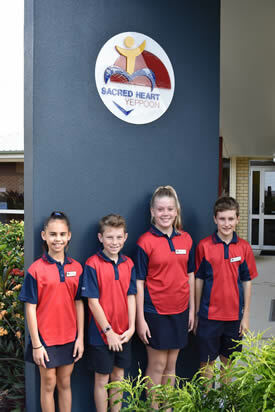 Sacred Heart School is a co-educational primary school located in the coastal town of Yeppoon. At Sacred Heart School, we endeavour to hold the message of Jesus Christ at the heart of all we do. This message permeates our relationships, decisions, our teaching and learning. Sacred Heart is a school where our children are nurtured spiritually, academically, emotionally, socially, physically and culturally. We offers a myriad of learning opportunities including instrumental music and choral programs, a well-developed Arts program, sports including netball, soccer, rugby league, swimming and AFL, the teaching of Japanese and the MJR (Making Jesus Real) program. We hope you enjoy perusing our website. Our Term 2 school captains begin their leadership role in the school this week. We wish Adah Warren, Tilli Sing, Preston Kimlin and Matthew Campbell the very best in these roles. We would also like to acknowledge the outgoing School Captains for their leadership during Term 1. Well done, Daniel Rees, Jackson Broom, Ashbi Berry and Jane Power. Purchasing aluminium seating for our Year 5s and 6s to use especially during lunch times. Organising a free Sunday breakfast morning during term 3 at school. Organising a Mother’s Day raffle. Investigating an evening guest speaker for parents/carers on a topical issue ie dealing with children’s anxiety. All of these initiatives are made possible by families paying our P&F fundraising levy of $25 per family per term. I thank you for your continued support of this levy. Congratulations to Kelsie Bennett and Jesse Emery on their selection last term to be part of this State wide program. Both participated in a weekend workshop culminating in a performance at TCC in Rockhampton. Kelsie and Jesse were involved in the singing and choir section. Well done.